We cannot say with a great deal of certainty how many people are taking advantage of America's citizenship laws by visiting the country to have their children. One potential source of data on "birth tourism", as it is sometimes called, is birth certificate records. But it must be emphasized that the characteristics of mothers and fathers in these records are based on self-reporting. Parents fill out forms in the hospital shortly after the baby is born and, among other questions, are asked their place of birth and their address. However there is no agency that verifies the mother's place of birth, address, or any other information on the birth certificate form. The Centers for Disease Control and Prevention (CDC) reports that 896,363 women who gave birth in 2012 indicated that they were born outside of the United States.1 If only 2 or 3 percent of these births were to women who are engaging in birth tourism, that would be 18,000 to 27,000 births annually. While this number would be less than 1 percent of the roughly four million annual births in the United States, the aggregate number of birth tourists babies would still be large, especially the cumulative effect over a number of years. Another potential source of information that may seem helpful in estimating the number of birth tourists (but is probably of less use than it seems) is the address mothers provide when giving birth. Those engaging in birth tourism typically stay with friends, family, or in some other residential setting arranged by those "selling" birth tourism services immediately before and after they have their babies. Unfortunately we simply do not know what share of birth tourist mothers provide a U.S. address vs. their overseas address. 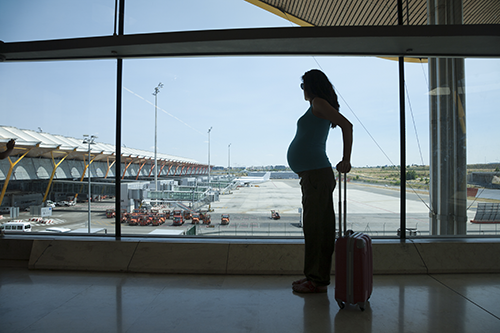 Further, some share of those providing an overseas address are U.S. citizens returning home to have their child on U.S. soil and are therefore not birth tourists. All of this dramatically reduces the usefulness of the addresses provided with the birth certificate. A third way to possibly estimate the prevalence of birth tourism is to combine administrative data and Census Bureau data. The American Community Survey (ACS), collected annually by the Bureau asks women if they had a child in the prior 12 months. The survey is designed to reflect the U.S. population as of July 1 of the year the survey was taken, so the survey is recording the number of women living in the country at mid-year who had a child in last half of the prior year and the first half of the year of the survey. In the second half of 2011 and the first half of 2012, the CDC reports 898,975 births to foreign-born mothers.4 The public-use file of the 2012 ACS shows that there were 863,407 foreign-born women who indicated that they had a child in the prior 12 months. The difference between these two numbers is 35,568 and implies that about 36,000 foreign-born women gave birth in the United States in the 12 months before July 1, 2012, but were no longer in the country. While there are a number of important caveats about this number, it provides some idea of the possible number of babies born to birth tourist mothers.5 But it must be emphasized that these numbers are only an estimate based on the very limited data available. It should be noted that this figure includes a modest number of U.S. citizens born aboard of American parents and individuals born in outlying U.S. territories. This definition of the foreign-born is different from the one used by the Census Bureau, which defines the foreign-born as those who were not U.S. citizens at birth. Later in this blog, I compare births to immigrants in Census Bureau data to births in the CDC data and use the CDC definition of the foreign-born. These figures can be found on p. 103 here. 2 See page 62 of the same CDC document in note 1. 3 One advantage of providing a U.S. address is that doing so avoids using a foreign mail system that may be of questionable reliability. But the most important advantage is that if a mother wants to travel back to her home country using a U.S. passport for her new baby, she will need a birth certificate to get the passport. This seems to be a common occurrence. In March 2015, CNN reported that one birth tourist used an address in "a high-end Irvine, Calif., apartment complex where one birth tourism company had rented a number of homes" for her newborn's passport application. A USA Today report on the investigation notes that the birth tourists were "promised Social Security numbers and U.S. passports for their babies before flying back home." On p. 76 of the warrant used to raid several birthing centers, the government lists "California birth certificates" as one of the items to be seized. (Affidavit dated March 2, 2015.) Clearly, the government believes that many of the women using such centers have the birth certificates sent to the centers and not to addresses in their home countries. This makes sense because waiting to get a birth certificate and passport before returning to your home country ensures that the birth has been properly registered and citizenship obtained. But this requires use of a U.S. address. I will add that my own personal experience also indicates that those engaged in birth tourism often provide a U.S. address. An immigrant family in my neighborhood in Fairfax County, Va., has complained to me that a relative who stayed with them before having her baby used their address and the family received bills from the hospital long after the women had delivered her baby and returned to her home country. 4 This is based on the distribution of births across months, with 51 percent of births occurring in the latter half of 2011 and 49 percent of births occurring in the first part of 2012. Data for 2011 can be found here and data for 2012 can be found here. 5 First, it is unknown what share of births are not recorded in state birth records compiled by the CDC. Second, there is both a margin of error in the ACS and some undercount of foreign-born women in that data. Third, some foreign-born women may have had a child and left the country, but they did so after many years of residence and should not be considered birth tourists. Fourth, a person who comes as a birth tourist but has a miscarriage is not supposed to be included in the birth records, only live births are included in the state birth data collected by the CDC. However, such a person would meet the definition of a birth tourist.